Eagles running back Corey Clement celebrates his first-quarter touchdown run against the New York Giants on Thursday, October 11, 2018 in East Rutherford, NJ. EAST RUTHERFORD, N.J. — The running back who amazed MetLife Stadium and a national TV audience Thursday night was not wearing an Eagles uniform. New York Giants rookie Saquon Barkley, from Penn State, dipped and twirled and hurdled and slithered and — well, all the other relevant verbs — to very little avail, given that he was playing for a team whose quarterback seemed to have been left out in the October rain long enough to rust. But Barkley's early 46-yard run, his amazing 55-yard journey with a short pass, and his later 50-yard sprint around the right side for a touchdown, pretty much accounted for the Giants' offense. He had 229 of the team's 401 total yards. 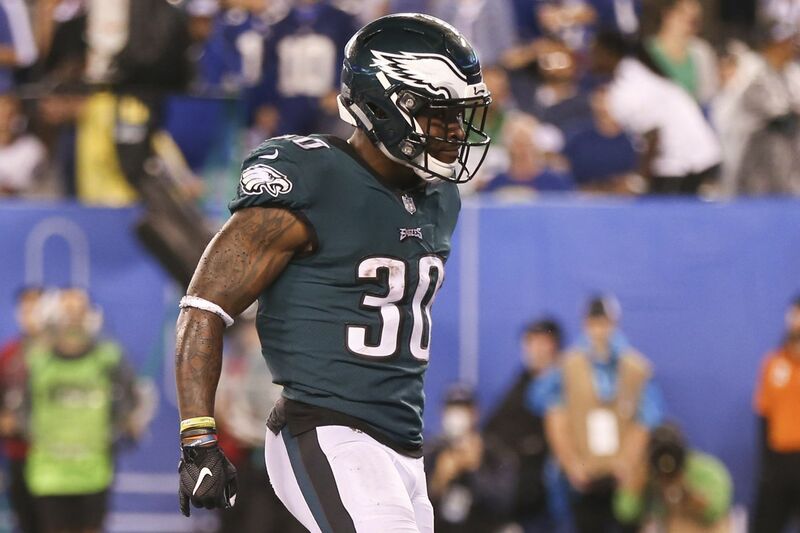 Wendell Smallwood and Corey Clement did not shock the world, but they performed ably for an Eagles offense that finally found a defense it could terrorize, in a much-needed 34-13 victory that gave the visitors their first NFC East win of the season and a 3-3 record, heading into a nine-day break. On this night, anyway, losing Jay Ajayi to a torn ACL Sunday afternoon did not doom the running game. Could the team still use an upgrade, despite Clement's strong assertion Tuesday that the Eagles have everything they need in the current running back room? Well, yeah. But maybe, when the season resumes Oct. 21 vs. Carolina, Darren Sproles will no longer be hamstrung and can provide that. Or maybe something else is coming by the Oct. 30 trade deadline. But Thursday night, the Eagles built a 24-6 halftime lead, with Smallwood starting and gaining 26 first-half yards on seven carries. Clement, apparently on a "pitch count" because of the quadriceps injury that kept him out of the Tennessee and Minnesota games, gained 21 yards on just three first-half carries, including the game's second touchdown. Carson Wentz helped the running cause with a 5-yard gain on a boot, and the Eagles had 52 yards on a whopping 11 carries by halftime — whopping by recent Eagles standards, anyhow. The final total was 30 carries for 104 yards. "This game was definitely a test for us, to see do we need to get somebody," Clement said. "I talked to Howie [Roseman] before the game — you have to have confidence in our room … We don't need to look on the outside, we know what we have on our team … I definitely told him that. He said, 'Make me believe that we don't need a back.' "
Undrafted rookie Josh Adams also was active, but while Smallwood and Clement conferred with running backs coach Duce Staley between series early in the game, Adams paced back and forth along the bench, out of earshot. He did not see an offensive snap in the first three quarters. Eagles coach Doug Pederson, facing criticism over managing just a dozen called runs in the Minnesota loss, said Wednesday, "the biggest thing is you get leads early in football games and then you can maintain the balance." A lot of people did not like that answer, and it left something to be desired, from the standpoint of not considering how a few solid runs early might bring some pace and continuity to a struggling offense. But Pederson was correct, in that when people just look at the final totals, if you build a lead and then protect it late, you end up having way more run-pass balance than maybe you would have managed if you'd been trailing. Anyhow, this was exactly how the Eagles addressed the second half, with their biggest lead of the season. Five runs on their opening 12-play, 75-yard drive, which used up six minutes and 18 seconds, Alshon Jeffery making it 31-6 with a 1-yard TD pass from Wentz on a screen. By the time Jake Elliott's 30-yard field goal gave the Eagles a 34-13 lead eight seconds into the fourth quarter, Smallwood had 13 carries, for 44 yards, and Clement had seven for 35. Smallwood also gave Eagles fans agita, as he is wont to do, by fumbling right after Barkley's touchdown run gave the Giants a little life. But replays showed Smallwood clearly recovered, though somehow the ball was wrestled away from him under the pile. "I was down there for I don't know how long," Smallwood said. "They were just rollin' me over, big guys jumpin' on me, but I knew I was down and I knew I had the ball." Smallwood finished the day with 47 yards on 17 carries, Clement 43 on 11. Clement also finished with three catches for 26 yards. "It felt good out there, taking on that load. I felt like me and Corey stepped up to the plate," Smallwood said. "We were able to go in and just do our jobs, that's all we were worried about. We didn't try to do too much … We did our job today and we came out with the win." This was despite some turbulence along the offensive line. Right tackle Lane Johnson, whose high ankle sprain got his listing changed to "questionable" Thursday morning, left the game in the fourth quarter after seeming to tweak the ankle. Before that, left tackle Jason Peters, battling a quad strain, suffered a bicep injury and exited. Peters said afterward the bicep problem wasn't serious. So, eventually, the o-line was Halapoulivaati Vaitai at left tackle, Stefen Wisniewski at left guard, Jason Kelce at center, Brandon Brooks at right guard and Isaac Seumalo at right tackle. If that is the long-term grouping, acquiring a game-changing running back might not change many games.